P rofessor Gordana Fontana-Giusti will take part in an evening of discussion exploring the discourses between Architecture and Psychoanalysis that will take place at the UCL – Bartlett hosted by Professor Jane Rendell (UCL, Bartlett) and Dr Lorens Holm (Dundee). The event celebrates the publication of Architecture and the Unconscious (Routledge, 2016) edited by John Hendrix and Lorens Holm. 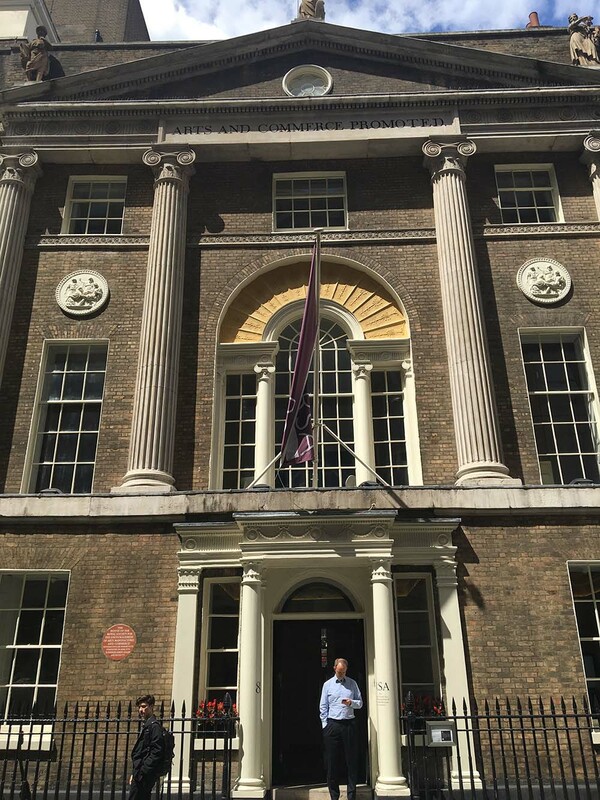 There will be responses from David Bell, Past President British Psychoanalytic Society; and Consultant Psychiatrist The Tavistock Clinic, Lesley Caldwell, Psychoanalyst BPA, and Honorary Professor UCL Psychoanalysis Unit, Patrick Lynch, Lynch Architects London, and University of Liverpool. Contributors to Architecture and the Unconscious: Andrew Ballantyne, Kati Blom, Hugh Campbell, Emma Cheatle, Gordana Fontana-Giusti, John Hendrix, Lorens Holm, Stephen Kite, Christina Malathouni, Tim Martin, Francesco Proto, Jane Rendell, Nikos Sideris, Alla Vronskaya. Professor Gordana Fontana-Giusti, KSA professor and Associate Dean of Graduate Studies, Faculty of Humanities has been elected a Fellow of the Royal Society of Arts (https://www.thersa.org). 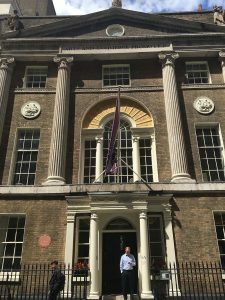 The Royal Society of Arts was founded in 1754 with a belief that the creativity of ideas could enrich social progress. As such, the RSA has had a long-lasting commitment to education and the environment. This election is an important recognition of Professor Fontana-Giusti’s work, which has concentrated on theory of architecture and urban design promoting the role of arts and humanities in sustainable urban design for cities today. Fontana-Giusti, G. (2016) ‘Zaha Hadid: 1950–2016’, Architectural Research Quarterly, 20(2), pp. 95–98. doi: 10.1017/S1359135516000348. Canterbury Cathedral hosted ‘Questions of Space: A Festival of Ideas’ which took place on 20 & 21 June 2016. This included a series of public talks, walks, sights and sounds. The Festival of Ideas is a partnership between Canterbury Cathedral and the University of Kent. Below is an eight minute documentary about the project, shot and edited by Stacie Lee Bennett. The vast spaces of Canterbury Cathedral hold 100 tonnes of air, continually moving and sometimes creating draughts. Using helium balloons to see where the air goes, we aim to find out how to improve air flow. Thermal qualities – warm, cool, humid, airy, radiant, cosy – are an important part of how we experience space. This walk invites you to help measure and test the different sensory qualities across Cathedral spaces and precincts to understand how they make us feel and why. We will be delving into the archives to discover Christopher Packe, who in the 1700s climbed Bell Harry Tower to get a “bird’s-eye view” of East Kent and, with the help of his theodolite (an instrument for taking precise measurements) created a new kind of map. This exhibition is about how we commemorate war thought architecture and monuments. A huge panoramic photograph taken at Buffs Road Cemetery in Ypres, France, brings feelings of loss and sacrifice at the Western Front to Canterbury Cathedral Bastian Chapel. Canterbury Cathedral is hosting ‘Questions of Space: A Festival of Ideas’ which will be running on the 20 & 21 June 2016. This will include a series of public talks, walks, sights and sounds. The Festival of Ideas is a partnership between Canterbury Cathedral and the University of Kent. Professor Gordana Fontana-Giusti will take part in Art Debate: Public Art at Turner Contemporary on Thursday 6 March 2014 at 6 pm. 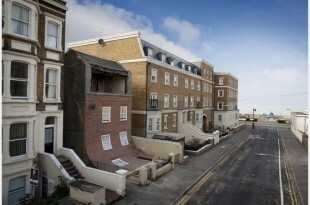 The debate will involve the artist Alex Chinneck who realised From the Knees of My Nose to the Belly of My Toes, popularly known as the ‘Slidey House’, on Godwin Road in Cliftonville with the support of Margate Arts Culture Heritage (MACH) and Thanet District Council. A panel of experts includes artists, curators, commissioners and architects. Chloe Street and Gordana Fontana-Giusti from the Kent School of Architecture are presenting at; The 10th International Conference of the Architectural Humanities Research Association (AHRA) – Transgression. The conference will explore the ways in which boundaries can be exceeded or subverted in order to develop new forms of architecture and architectural practice – as well as new understandings of architecture and the role architecture could play. These boundaries might be theoretical, professional, social, spatial, disciplinary, legal, historical or physical. The conference will be hosted by the Department of Planning and Architecture at the University of the West of England, Bristol on the 21-23 November 2013. Lea Valley Drift was formed in the Spring of 2012, and awarded funding by the LLDC ‘Emerging East’ project, in anticipation of the Olympic North Park opening in July 2013, alongside other culturally inclusive community projects. Through this commission, a pair of local maps, with walking routes, and a book, Beyond the Olympic Park, have been developed with the integration of the Olympic Park with local communities and the inauguration of the Public Park in mind. By foregrounding the analysis and interpretation of the experiential qualities of found urban space through fieldwork and re-thinking cartographic means, our maps explore adjustments to perception and use without the requirement for physical change. We contend that experience and use of public space is primarily affected by our perception of what it is for and what it might be for, and secondarily by what it physically lends itself to being. 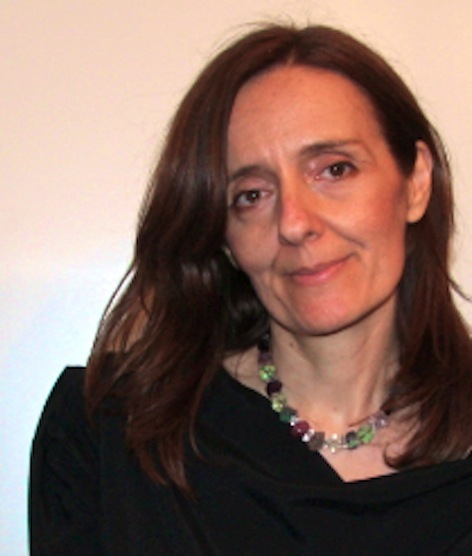 Gordana Fontana–Giusti will give a paper on Transgression and Le Corbusier’s Journey to the East. This paper will investigate how Le Corbusier’s Journey to the East could be considered a transgression. In contrast to the ‘Grand Tour’ travellers of the eighteenth century who searched for legacy of the classical antiquity, and distinct from the self-conscious romantic ‘adventurers’ of the nineteenth-century, Charles-Edouard Jeanneret’s 1911 journey to the east was less grand and obsessive, while possibly even more absorbing, life-changing, transgressive and industrious. Prof. Gordana Fontana-Giusti, along with three PhD students, Carolina Vasilikou, Tordis Berstrand and Gian Luca Amadei, are taking part in a two week exchange project in Beijing, China. The purpose of the 2013 British-Chinese Architecture Students’ Workshop is to turn the industrial remainders of the Capital Steel Factory, which has now been moved out of the city, into public facilities which will help redevelop the site and therefore trigger the growth of the area around the site. 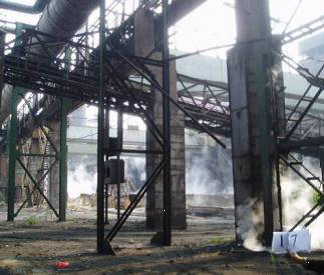 The Capital Steel Factory, founded in 1919, was once the largest steel producer of China and the output reached its record high at 7.93 million tons in 2005. Due to the plan for the 2008 Beijing Olympic Games and the requirement for improving the environment of the city, the CSF was gradually moved to other locations including Caofeidian in Bohai Bay, Hebei Province – a new town by the sea around 200 km away, . The CSF site is situated at the western end of Chang’an Avenue, a main road of the city and although it is around 19 km away from the city centre it is relatively accessible. Downtown is over-crowded and there is traffic congestion throughout the city; the CSF site, however, is another story. It has gradually turned into a lost industrial landscape with vast expanses of unused land and empty constructions which are rarely visited. The students have been encouraged to meet the challenges by, firstly, taking social, cultural and economic matters into account, analysing the features of the site and finding out the problems and the challenges of the project. Secondly, by understanding the relationship between the planning positioning for CFS and the development of Beijing, proposing a functional planning and the developing direction for the site. Finally, finding solutions based on a comprehensive analysis and applying them to architectural and urban design. We are looking forward to catching up with Gordana and the PhD students on their return to hear all about the trip. Professor Gordana Fontana-Giusti will present a new theoretical interpretation of Leon Battista Alberti’s work on 26 February at 18.30 at the Royal College of Art, Kensington Gore, London SW7. 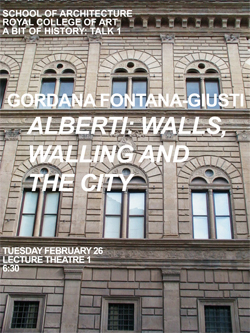 Alberti, Walls, Walling and the City. The focus of this talk is on the effects of the displacement of the city walls in the gradual process of ‘crystallisation’ of urban space from the fifteenth century onwards, looking at the underlying dynamics of public space within the city, whereby the visible physicality of walls contains and sometimes belies the invisible logic of their effects. Her related article has been published in The Journal of Architecture. Professor Gordana Fontana-Giusti will present a new theoretical interpretation of Leon Battista Alberti’s work on 5 February at 18.30 at the Royal College of Art, Kensington Gore, London SW7.